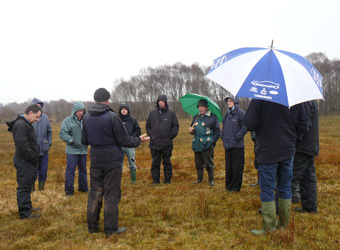 Early April and 2 weeks of no rain is unheard of in County Fermanagh, yet typically the day we decide to hold our High Nature Value (HNV) farm walk the rain fell, but this didn’t dampen the spirits or enthusiasm of those Halting Environmental Loss Project (HELP) farmers and representatives from Department of Agriculture & Rural Development (DARD) & Northern Ireland Environment Agency who attended. The concept of HNV farming has a low level of recognition in Northern Ireland, therefore the purpose of this event was to develop the relationships Giles Knight (HELP project officer) has made with local Fermanagh farmers through the HELP initiative, along with staff from RSPB and European Forum for Nature Conservation & Pastoralism (EFNCP), to begin to raise awareness of HNV farming and highlight the importance of how these extensive farming systems can support biodiversity and wider ecosystem services among the HNV farmers themselves and with policy makers. Patrick McGurn (a HELP farmer) kindly hosted the walk on his farm in Portinode, Kesh. 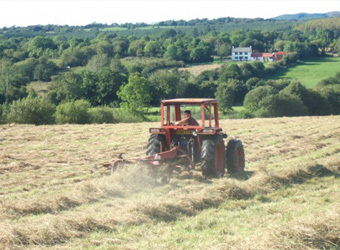 The farm is 41ha bordering the Lower Lough Erne. Patrick & his father run a herd of 15 suckler cows, calving in spring and sold locally to market at approximately 6 months old. There are a mix of cows depending on what replacements are available (Belgium/blue cross, Aberdeen Angus as a terminal sire for ease of calving and Kerry Black). Armed with umbrellas Patrick guided us around his farm explaining the management he is undertaking to manage rush encroachment on their wet grassland/ lowland raised bog fields for breeding waders and traditional hay meadow management (one of the only remaining hay meadows in the area) for marsh fritillary butterfly, and discuss the issues he is facing. One of the points coming though strongly was that it would be far easier for Patrick (and his father) to farm intensively. Their current system of farming benefits species, habitats, water quality, carbon storage and protects landscape features, yet it is far more expensive and time consuming, particularly as Patrick’s agri-environment scheme expired in February. Giles also highlighted how important these extensive farming systems are in the area for the survival of many vulnerable habitats & species. The independent advice provided through the HELP project has been invaluable in helping farmers understand what species they have on their farm and how to manage some of these difficult habitats. 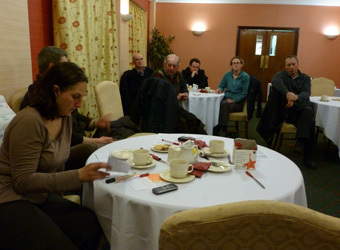 In the afternoon, just as it brightened up, we moved to a local hotel where Deborah Deveney (RSPB) facilitated a discussion led seminar. This provided the HELP farmers with an opportunity to share their experiences with others, and help us all understand the challenges farming faces in Fermanagh, with the aim to identify any support mechanisms they felt they needed to be able to be able to continue farming sustainably for wildlife & wider ecosystem services. This proved an invaluable session evoking powerful statements like: “If AES did not exist I would pack-up farming and the land would be either bought up and intensified or abandoned”. Just listening to the farmers recount stories of being kept awake by corncrake was quite moving, yet within the past 20 yrs this species has declined with the last confirmed breeding record for Northern Ireland in 2007. The farmers remarked how knowledge of skills and wildlife are being lost, ie young farmers unaware that corncrakes once bred in these areas. 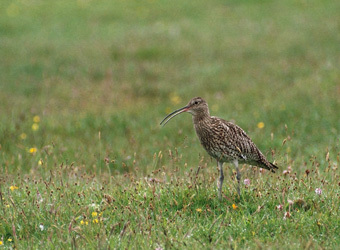 Interestingly, the farmers were determined that the curlew doesn’t suffer the same fate. In fact, many of them commented that they weren’t aware of how special their land and farming systems are if it wasn’t for the visits from the HELP project officer to inform them. 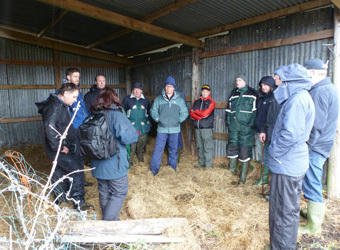 We undertook an exercise to assess how important other outputs on the farm are to the farmers. All farmers agreed that producing a ‘high quality’ product was of high importance, along with supporting wildlife, protecting the landscape, cultural heritage and water quality. 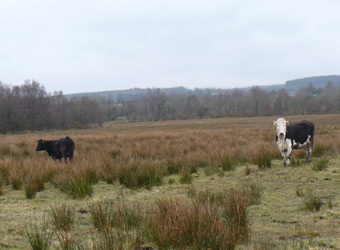 It was evident from the farm walk and group discussion that these farmers take immense pride in their land and want to manage it sympathetically for farming and wildlife for as long as they feasibly can, yet currently farming in Fermanagh hangs in the balance. Many HNV farmers farm in a market that does not recognise the wider public goods these systems provide for society, and therefore they are asking for better mechanisms of support to be put in place through the CAP reform to ensure they can hand over their land to future generations in better condition. Knowledge that your farming system is valuable, and being told by advisers (such as Giles) that your management is special for supporting fragile species. There is an assumption that farmers know this but it was evident that they didn’t. What needs to change to support those farmers who choose to farm HNV? 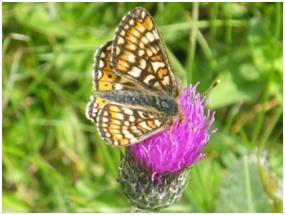 In 2010 the Halting Environmental Loss Project (HELP) received £1.5 million from the European Regional Development Fund’s INTERREG IVA Programme, the Department of Environment in Northern Ireland and the Department of Environment, Heritage and Local Government in the Republic of Ireland. Working in Partnership with RSPB Scotland and BirdWatch Ireland, RSPB NI implement a range of actions to assist chough, corncrake and breeding waders (lapwing, curlew, snipe and redshank). In Northern Ireland, the focus is on several important areas for breeding waders – Lough Foyle polders, Lough Beg, Lough Erne and Glenwherry. In these areas agri-environment uptake is high but training and advice is being given to farmers, on how to manage for waders. RSPB NI is also building on successful work for waders on our own reserves at Lough Erne, and in the case of Lough Beg, has invested in specialised machinery to assist farmers with the control of rushes. HELP a £1.57m project that is funded through the EU’s INTERREG IVA Programme which is delivered locally by the Special EU Programmes Body. The Special EU Programmes Body is a North/South Implementation Body sponsored by the Department of Finance and Personnel in Northern Ireland and the Department of Finance in Ireland. It is responsible for managing two EU structural funds Programmes PEACE III and INTERREG IV designed to enhance cross-border co-operation, promote reconciliation and create a more peaceful and prosperous society. The Programmes operate within a clearly defined area including Northern Ireland, the Border Region of Ireland and Western Scotland. The INTERREG IVA Programme, funded under the European Regional Development Fund (ERDF), is worth €256 million and aims to address the economic and social problems which result from the existence of borders. It has two distinct priority measures to create co-operation for a more prosperous and sustainable cross-border region. Photo credits: Sheltering from the rain (Giles Knight), Cows grazing at Kesh (Deborah Deveney), Giles talking about wildlife benefits of HNV farming (Deborah Deveney), Marsh fritillary (Patrick McGurn), Seminar session (Giles Knight), Curlew (Chris Gomersall – RSPB images), Hay cutting at Kesh (Patrick McGurn).